Republican presidential candidate Mitt Romney is getting some puppy love from none other than Donny Osmond. The entertainer and former teen heartthrob has given $2,500 to Romney’s campaign, according to an FEC filing. 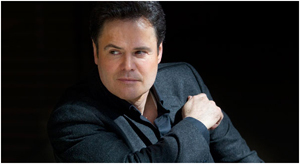 Osmond, like Romney, is a member of the Church of Jesus Christ of Latter-day Saints. It appears to be the first time he’s cut a big check to a presidential contender. Perhaps he’s hoping to score the singing gig at Romney’s Inauguration? Osmond declined to comment on the contribution or his support of Romney. But he did speak up during the former Massachusetts governor’s last presidential run. Noting that he and Romney share a religion, Osmond told CNN’s Larry King in 2007, “I think it’s been absolutely wonderful for the Mormon Church to have Mitt out there.” His siblings Marie and Jimmy also praised the candidate at the time.